This is the standard construction method for the Conifer Skirt waistband and will walk you through what you need to do with or without a pocket. If you are a beginning sewist, check out the simplified waistband construction instead. 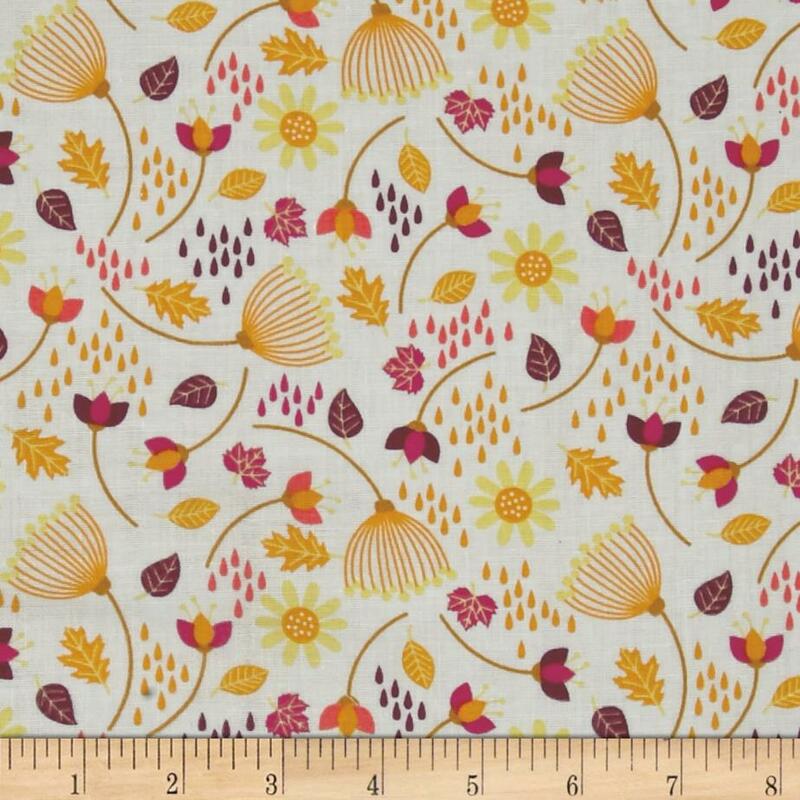 Before reaching this point, you should have selected your fabric, selected your size, selected the stitch you will sew with, and sewn the layers and sides. [28-29] The photos used in this sewalong show the wide yoga-style waistband, but the process is exactly the same for the narrow waistband. Sew the two Waistband pieces right sides together along the sides. For the yoga-style waistband, make a notch in the seam allowance at the center point (this allows the waistband to fold down without creating a bulge at the center. Press the side seams of the waistband open. Sew one side of the pocket to the waistband, matching the notches so you get your placement correct. Start and stop the sewing 5/8″ in from the edge of the pocket (marked here in chalk). 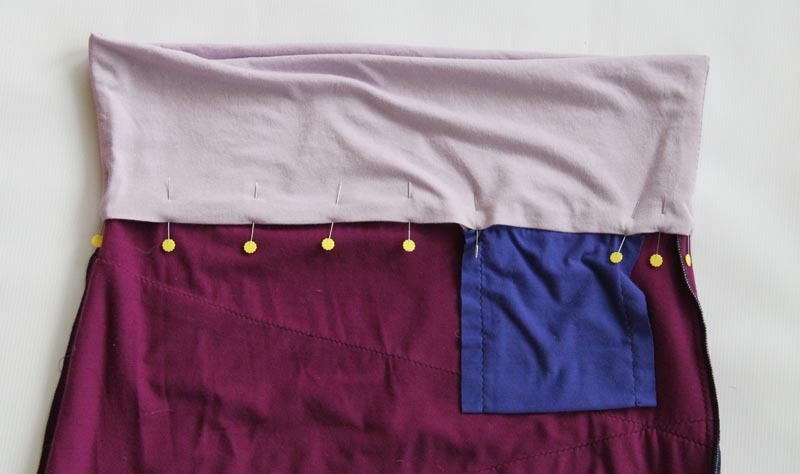 Sew the other side of the pocket to the top of the Skirt Front, right sides together and starting and stopping 5/8″ in from the side, like in the previous step. 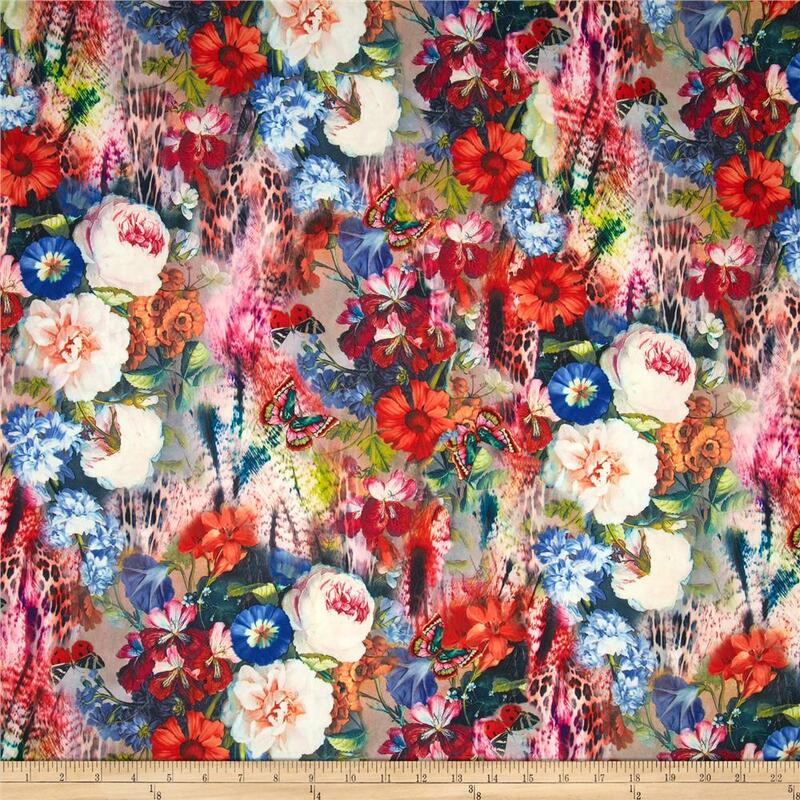 For this seam, you want to sew over a length of clear elastic or 1/8″ elastic to stabilize the seam. The elastic should extend beyond where you have sewn it. Cut 1/2″ x 1/2″ squares out of each corner of the pocket. This reduces bulk at the waist and makes it easier for the pocket to lay properly. Pin one side of the waistband to the top of the skirt all the way around. Ignoring the pocket in the photo above, pin one side of the waistband to the top of the skirt all the way around. Sew the Waistband to the Front/Back along the top, starting and stopping your stitching where the pocket is stitched to the waistband (e.g. the starting point is marked by the pin in this photo and the stopping point would be the other side of the pocket ). This is what the seam looks like once stitched. Ignoring the pocket in the photo above, stitch the waistband to the skirt along the pinned seam. or  Grade the seam allowance. The seam allowance closest to the outside of the garment should be the longest and the the other one (or two if you have layers on your skirt) should be shorter. or  Press the seam allowance between the skirt and the waistband up. Put a snip into the various seam allowances at the corner of the pocket, being careful not to cut through any seams. This allows the pocket to hang down while the waistband goes up. or  Fold the top of the waistband to the wrong side 1/2″ (this is just less than the 5/8″ seam allowance because we want it to barely cover the seam when we fold the waistband in half in the next step). or  Fold the waistband in half, allowing the pressed edge of the waistband to barely extend past the seam between waistband and body, and pin in place. From the right side, stitch in the ditch (meaning stitch along the seam between the waistband and the skirt) to stitch the waistband in place. This seam will never be visible on the yoga style waistband (although it will on the narrow waistband). When you reach the pocket, stitch behind the pocket, being careful not to get the front of the pocket in your seam. Make sure that you leave a gap of a couple of inches in this seam so that you can later thread your elastic into the waistband. From the right side, stitch in the ditch (meaning stitch along the seam between the waistband and the skirt) to stitch the waistband in place. This seam will never be visible on the yoga style waistband (although it will on the narrow waistband). Make sure that you leave a gap of a couple of inches in this seam so that you can later thread your elastic into the waistband. This is what the seam should look like from the inside. You just barely catch the edge of the waistband piece on the inside. Stitch a line stitching in the waistband, 1″ above the seam between the waistband and body. It’s important to be careful that you get the spacing perfect on this seam because if it is too small, you won’t be able to slide your elastic through the channel but if it is too large you will see the line of stitching on the top of your finished skirt when you wear it. Because the waistband will be covering any markings on the plate of your sewing machine, you will want to use a guide on your machine or chalk the stitch line before you stitch it. Cut a length of elastic according to the elastic sizing chart or whatever length is comfortable for you with your elastic (since some people like wearing elastic tighter than others and some elastic is stretchier than others). Use a safety pin on the end of the elastic to thread it through the channel. …and stitch it to itself near both ends to secure it. Stitch closed the gap in the seam between waistband and body that you used to thread the elastic. Start playing Dress Up Every Day!